The eleventh of the little tales, ‘The Tale of Tom Kitten’, sees Tom and his sisters, Moppet and Mittens, dressed in their finest clothes ready for a visit from their mother’s guests. After being sent to the garden to amuse themselves, the kittens fail dismally at keeping their clothes clean and tidy, eventually losing them to the passing Puddle-Ducks. 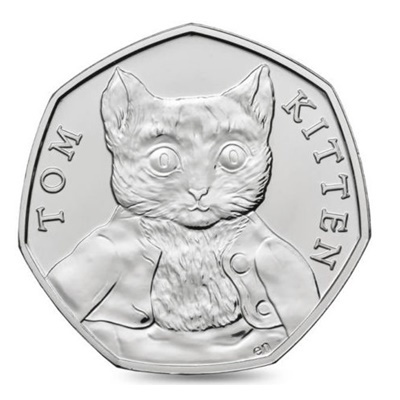 Tom Kitten has never been struck on an official United Kingdom coin until now. 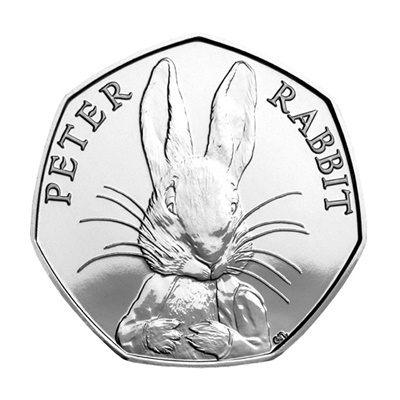 The design puts the mischievous cat at the centre of this 50p coin.